The summer heat is upon us and everybody is desperately looking for some respite from the Sun as it beats down upon us. So if you are planning a vacation this summer, take a look at these waterfalls which will help you make up your mind. The forests that surround most waterfalls, they are a delight not just for the casual tourist but also the photographer, the trekker, and the wildlife enthusiast. The second largest waterfall in India, this spectacular fall is located in Karnataka inside the Cauvery Wildlife Sanctuary. Dense vegetation and plenty of wildlife surround the Eastern and Western branches of this fall and the rocky cliff from which it falls is a magnificent sight to watch. This is an ideal spot for photography enthusiasts and those with a desire for adventure. It is not only in India nature has given many amazing and beautiful waterfalls around the world. This is perhaps the most famous waterfall in the country thanks to Bollywood. Located in Goa on the Mandovi River, this is one of the highest waterfalls in India with a height of over 1000 feet. In the monsoon, the waterfall gushes down from the crescent-shaped valley. The most beautiful view of the fall is undoubtedly one from the train that passes over a bridge suspended halfway in the valley, crossing the waterfall. It is one of the most famous waterfalls in India for its beautiful landscape. We also want you to know about longest rivers in the world. This very popular destination in Kerala is also the largest waterfall in the state. It is located amongst lush green vegetation, plenty of forest cover and some rare species of animal like the Great Indian Hornbill, the Nilgiri Langur, and the Kochi Forest Cane Turtle. This waterfall is popularly known as the Niagara Fall of India. Though monsoon is the best season to visit this waterfall, it sees large amounts of tourists in all seasons. You will be surprised to know about beautiful lakes around the world. Also, read about places to visit in Bangalore. This beautiful waterfall is tucked away in the tourist town of McLeodganj in Himachal Pradesh. It is not as high or grand as the other waterfalls on the list but it is definitely one of the best. One can see many wandering tourists stumbling upon this waterfall to find some peace of mind. This waterfall is a go-to destination for trekkers and adventurers who come to McLeodganj to begin their adventures. The best season is during the summers and the monsoon and this is the perfect summer getaway. One of the best waterfalls in India and famous for trekking. We have also listed coldest places in India. The second Indian waterfall from Kerala to feature on this list, this waterfall is located near Elevayal and is also called the Sentinel Rock Waterfall. This is a popular day outing spot for the locals and many families come out here to spend the day camping. For the tourists, this is the perfect spot for rock climbing along the waterfall and trekking on the route that leads to the top of the fall. The monsoons are the best season to visit this waterfall. This magnificent waterfall is located in Shillong, Meghalaya, popularly known as the Scotland of the East. This waterfall sees many tourists during the monsoon when the weather is the best in Meghalaya. What makes this waterfall unique is the rock formation over which it flows and the three branches of the waterfall that flow in sequence. However, if you want to avoid the bustling crowd, it is better to go in the summer when it is quieter and you can enjoy some time alone near the waterfall. This fall in Karnataka is the tallest un-tiered waterfall in India and the second highest overall. It is situated amidst green forests and offers plenty for those who seek adventure. Trekking down to the pool that forms below the waterfall will give you the chance to swim under the waterfall while trekking up to Watkins point will give you an unforgettable view of the landscape. There are also numerous trek routes that pass through the forest and lead up to the waterfall. The travel to this site is very convenient and the best time to visit is the monsoon season. Also known as the Bong Bong falls; this waterfall is one of the many undiscovered wonders of Arunachal Pradesh. It is located in Tawang, home to the famous Tawang Monastery and is fast gaining publicity because of the beautiful view of the village that it offers. If you are planning a visit to the seven north-eastern states, this waterfall must be on your list. However, the paperwork could be a hassle as a government permit is sometimes required to visit areas of Arunachal Pradesh. The third Indian waterfall from the North East to make it onto this list, this waterfall is located in one of the wettest places in the world – Cherrapunji. It is close to Shillong and Guwahati and has convenient access by road. The unique feature of this waterfall is the fog that slowly ascends along the length of the fall as visitors watch from a platform built on the opposite side. The waterfall hits many rocks on the way down and makes a distinctive roaring sound as it thunders down. The beautiful scenery makes this spot a must-visit for the photography enthusiasts. One of the best waterfalls in India for photography. 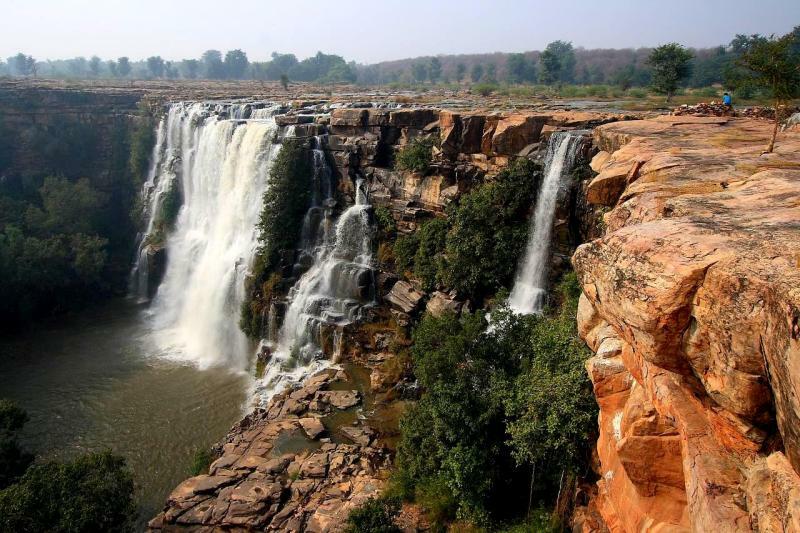 It may seem unlikely that the sandy state of Rajasthan has one of the best waterfalls in India, but Bhimlat falls offer a pleasant surprise to anyone who doubts this. Though this waterfall is seasonal and not very high, with a height of just 60 meters, it gives much-wanted respite from the heat of the desert. It is easily accessible by road and is near the tourist town of Chittor, famous for its royal palaces and indulgences it offers tourists. If you plan to visit this state, Bhimlat should definitely be on your list. Also, read about tourist places to visit in Rajasthan. There are many questions related to rivers, waterfalls, and beaches you don’t know, Let me give you an example. Be they small or large, the thunderous sound and soft trickles, the spray of cool water and the dazzling view of forests all enthral the tourists, who appear tiny in front of the enormous water bodies. So which of these waterfalls do you want to head to next? Very well written article. I was planning to visit “Hogenakkal Falls” as it is near to Bangalore. I thought, I am selecting one of the beat water falls of India. But this list gave me many other options to look for. Looking forward to get the more amazing article.